Animal organs. Digestive system. Liver and pancrea. Atlas of plant and animal histology. Numerous substances that are implicated in digestion are released into the digestive tract. Many of these substances are produced in glands that are situated in the wall of the digestive tract itself. These include the gastric glands of the stomach and the Lieberkühn crypts of the small intestine. However, there are two large sized glands associated with the digestive tract that are also involved in digestion: the liver and the pancreas. They are considered organs rather than just mere glands. Apart from releasing essential components for food digestion, the liver and the pancreas also perform other important functions for the body. The liver is formed from an invagination of the digestive tract wall during the embryo development. It is the largest viscera of the body and weighs about 1.500 g in humans. The liver performs numerous functions, which include producing plasma proteins, keeping balance of the concentration of glucose, vitamins and other nutritive substances in the blood, serving as a major detoxifying center, producing bile fluid, and acting as an endocrine gland. The liver is highly irrigated by arteries that come directly from the digestive tract, the spleen and the pancreas. Both endocrine and exocrine secretions of the liver are produced by hepatic cells, also known as hepatocytes. 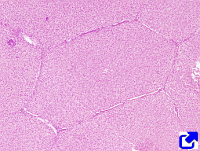 The hepatic exocrine secretion is the bile and is collected in the hepatic canaliculi, which carries it toward the gallbladder, where it is stored. When required during digestion, bile is released from this temporary storage into the duodenum. The pancreas is an elongated gland, much smaller than the liver, and situated at the same level as the duodenum. It has two cellular components or systems that can be clearly differentiated physiologically and structurally: one is endocrine and the other is exocrine. The endocrine component releases hormones, such as insulin and glucagon, both regulators of the metabolism. The exocrine component produces enzymes that are needed for digestion and are released into the duodenum.